We're so excited to now be offering Spiral-O wires! With the combination of the classy and professional look of traditional twin loop wire binding, and the special 19-loop spacing, you can pair these wire binding spines with your GBC plastic comb punch pattern. That means you don't have to spend money on a new wire punch machine to elevate your binding documents -- just punch your pages with a plastic comb punch, put the wires in the 19-holes, and close the wire with a wire closer unit. These wire bindings are seriously cool, and they will seriously save you money! You can even pair them with 19-hole pre-punched paper and pre-punched covers, which means the only piece of equipment that you need is a wire closer. Simple, inexpensive, and professional...we love it! And that's it! Document binding with Spiral-O is incredibly simple, and takes no time at all! Spiral-O wire combs are stocked in diameters (sizes) from 1/4" to 1", which means you can bind documents up to about 210 sheets. Use this spiral binding wire comb capacity chart to help choose the best size for your document binding. • Lay all of your pages, including covers, on a table. • Don't hold down the stack, and measure the thickness of the binding edge. • Add 1/8" to that measurement - that will be the recommended binding size. 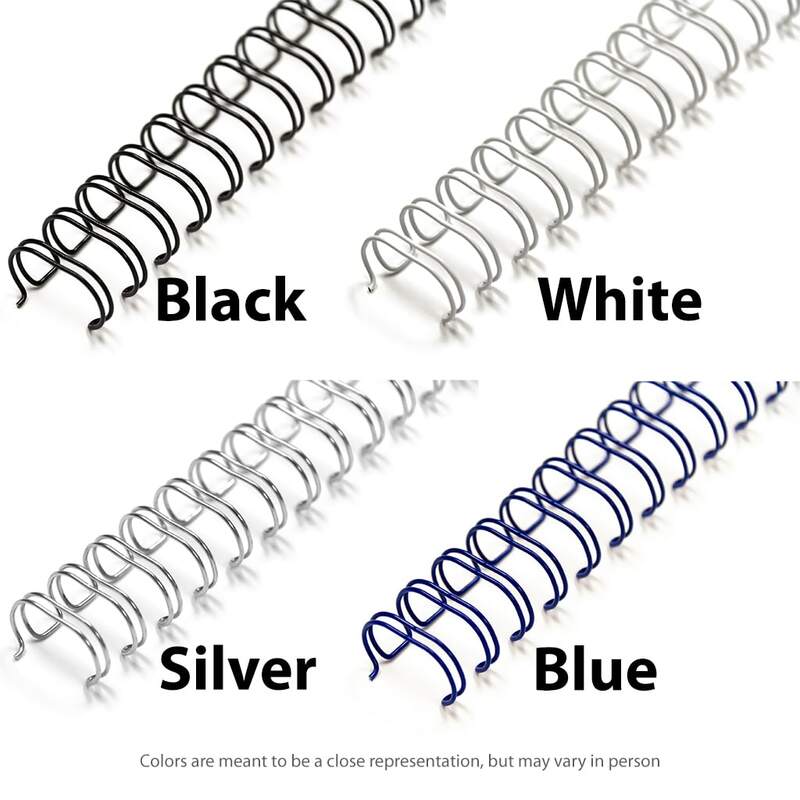 Spiral-O twin loop wires are stocked in black, white, silver, and blue colors. They pair perfectly with most businesses colors, for a subtle and professional document binding solution. *Sheet capacity determined using 20 lb. bond paper. Capacity may vary depending on paper stock, covers, and other materials being bound.